MapleStory, which is one of the most active free-to-play MMORPGs, is set to receive its biggest content update this year. Players will need room for seconds (and even thirds) this holiday after they try out two brand-new character classes, level up new characters and gets lots of rewards, experience new story episodes and daily dungeons, and much more. The Nova update rolls out on Nov. 29, 2017 and continues with content releases through Jan. 3, 2018. The second brand-new character class, Illium, needs to take his magic skills to the next level. Once he encounters the ancient Crystal he can awaken his amazing power. Prepare to obtain newfound power as Illium, unravel the stories of the Winter Bard, journey to the Swamp of Memories, and defeat the new Papalatus. 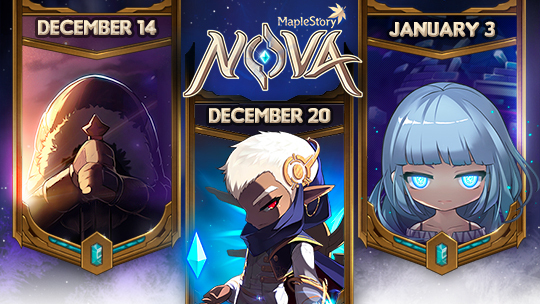 Nova continues with three exciting updates which bring new playable character Illium (Dec. 20), the story of the Winter Bard (Dec. 14), and new high-level area, Morass (Jan. 3)!